Reproduction buckle cover includes GM Mark of Excellence emblem, button and spring assembly, for Standard interiors. This is a plastic cover, unlike the deluxe interior models which included a die-cast buckle cover. Availabe in black only; however, it can be painted to your desired color with one of our lacquer paints. Sold individually. 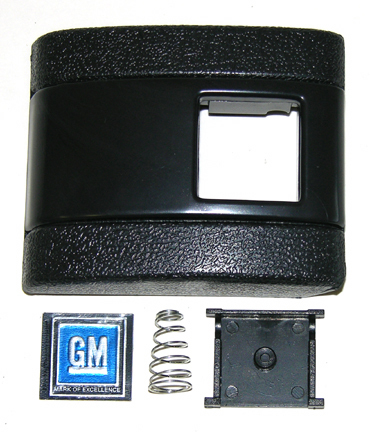 Buckle cover features the correct for 1968-72 "GM Mark of Excellence" on the button.